Legendary Senegalese band Orchestra Baobab, who reformed last year after 15 years apart, are the biggest winners at this year's BBC Radio 3 World Music Awards. The group, one of the most popular bands on the world music scene, won the prestigious critics' choice award and were named best African artists. Among the other victors were Portuguese diva Mariza, Moroccan star Samira Said and Afghan group Ensemble Kaboul. The winners were announced on Radio 3 on Saturday, but the award ceremony - where many of the winners will perform - will not be held until 24 March. This is the second year of the awards. Hollywood star Johnny Depp turned up to present an award at the inaugural ceremony in 2002. This year, Orchestra Baobab won the critics' award for album of the year with Specialist in All Styles, which revived their mellow sound encompassing styles from across Africa and Cuba. It was their first new album since they split in 1987 - but the wider world did not discover them until the late 1980s and early 90s. 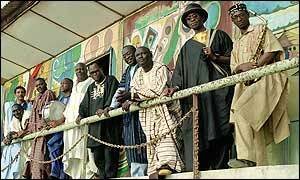 Originally formed in 1970, they were persuaded to get back together by fellow Senegalese star Youssou N'Dour and their record label, World Circuit, and went on a successful tour in 2001. They beat off competition from Bembeya Jazz, Kasse Mady Diabate and Tony Allen in the Africa section of the awards. Elsewhere, the Swiss-based Afghan group Ensemble Kaboul and Mahwash, described as Afghanistan's best traditional band, were winners in the Asia-Pacific category. They kept the traditions of Afghan music alive while music was banned under the Taleban, and recruited Ustad Farida Mahwash, who was Afghanistan's top radio star of the 1970s and the only female vocalist to get the celebrity status of Ustad, which means master musician. In the Middle East category, Egyptian-based Moroccan singer Samira Said, who is a star throughout the Arabic-speaking world, was triumphant. Glamorous Portuguese vocalist Mariza, who is credited with reinvigorating the traditional fado blues style, won best European artist. But French tango innovators Gotan Project beat her to the title of best newcomer. Mexican political "tropi-punk" group Los de Abajo won in the Americas category, while Swedish and Senegalese collaborators Ellika and Solo got the prize for "boundary crossing". The award ceremony will be hosted by club DJ and presenter Rita Ray and Radio 3's Verity Sharp at London's Ocean venue. It will be broadcast live on the radio station's website, and several days later on the station itself and digital TV channel BBC Four.